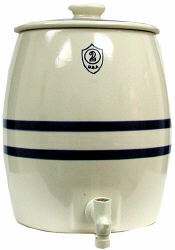 This stoneware keg is ideal for back yard barbeques, reunions, parties or other indoor or outdoor events. The generous two gallon capacity keeps plenty of your favorite beverage available for your guests. Food safe, this keg contains no lead or other harmful chemicals. This keg also makes a great decorative piece for your kitchen, den, deck or patio. Please note: The 2 Gallon Keg does not come with the spigot packed in it. The spigot must be ordered separately. Do you make the jugs in different colors. I am interested in a more artistic but functional jug. Also, can you fit a cork and wood spigot into the jug?